Gold is often found associated with the mineral ore. It is sometimes associated with other minerals as well, including iron and manganese oxides, calcite, pyrite and other sulfides as well. Often, when you finish the gold ore crush, you need grind it with gold ore grinding mills. Ore grinding mills can be divided into wet grinding and dry grinding. According to the different application, there will be open-circuit grinding and closed-circuit grinding process. Our engineer will design different grinding lines for your gold ore grinding requirements. The most popular ore milling machine are ball mill, raymond mill, trapezium mill. SBM can offer types of gold ore grinding machine used as gold ore milling equipment. Ball mill can be used in gold ore grinding plant, SBM can offer stamp mill for gold ore crushing plant, raymond mill for gold ore milling. 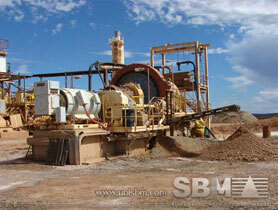 From mining, crushing to extraction and grinding, SBM can design the whole gold ore plant for sale. "SBM gold ore grinding machine service us with high capacity and high efficiency. Hope to cooperate with SBM later."